In this Journey I will invite the participants to be moving to unfold a haptic understanding of the world, society, other and self. Touch will be looked at on different levels, concretely, between the bodies, but also metaphorically, expanding qualities of experience of touch towards working with other senses, and even further into ways of choreographing and thinking about politics of dance. Touching and being touched (consensually) happen at the same time and this simultaneity of the activity and receptivity, being a subject and a location of an action, this oscillation and exchange between different subjectivities around a point/space of contact is what we will enhance in our experiencing of dancing. I will guide an open inquiry towards different practices of touch (anatomical hands-on work, partnering, contact improvisation), questioning the edges of codified and functional within these, to create a space for finding new sensations, new experiences of what touch can serve, mediate, create. In western use of language there are only few words for describing touch and even less for describing experience of being touched: so we will invent ways to note, talk and share our experiences. Rather then through seeing / the image, we can allow ourselves to be affected viscerally and stay with this level of engagement with our contexts (the surrounding space, the others). Some notions that we’ll explore around the theme of touch: volume, confirmation, safety, border, surface, resistance, heat, lust, energy, transfer, friction, slip, growth, longing, enduring, time/rhythm, ideosyncracy, antromorphism, submission, gentleness, generosity, synesthesia, color, shape, smell, direction, movement. These extended considerations of touch will be expanded towards other senses – sight, hearing, kinesthesia – reorganizing how we see, hear, move, take in and communicate. We will work with the sensuality, sensitivity and sensibility of the body, being in movement as reading of the space and time that envelops us, through the articulation of simultaneous state of touching/receiving touch. To support the movement, resources from different practices of somatic work will be used, working on cultivating the attention to materialities, anatomies and architectures of our bodies. The work will extend further to include different modes of expression (voicing, writing, working with objects, video/audio recording), allowing experiences from one mode to shift and be translated to another, in fast pace, allowing different materials to overlap and co-exist in the same space. Carefully witnessing this process will enable us to map our own creative process in real time, listening to its feedback so that we can connect to our individual creative flow, owning our dances with a clearer sense of agency. Some time will be devoted to mediating yourself directly into your non-stop speaking, your thinking into your non-stop movement, falling over the edge of control and into the space between yourself and the others, as an experience of productive incompleteness and fragility and to practice paradox and oscillation. Out of that process, immersive dancing sessions will arise, looking at time as a space that is composed as a structure, or a texture - made by play of duration and frequency, surface and depth, volume and weight, light and shadow. We will practice writing choreographies by embodiment, rather then through form/image/thought, while extending our gained sensitivity to work with the sense of ‘performance’ as one possible frame for our dance, understanding the symbiosis of different positions of spectator and performer (playing with creating different physical situations - blindfolding, moving while watching, reframing while doing etc. ), to sensitize us to ways of being dancing. Sonja Pregrad is a dance artist, performer, organizer and collaborator, being based in between Berlin and Zagreb, Croatia. She has been dancing since the age of 3, being too hyperactive not to be sent to do it and being imperfect enough to never be fully accepted to the ‘good dancers’ club, which has left her on a great place at the edge from which she had to keep on asking herself: ‘but what is it actually, what is ‘dance’ really?’ In this, she has been influenced by the post Judson Church lineage and by the somatic teaching of Eva Karczag, Mary O’Donnell, Tony Thatcher and others at the European Dance Development Centre in Arnhem, and later by the practices of Jeanine Durning, Maria F. Scaroni and Siegmar Zacharias at MA SODA in Berlin. Growing up in an ex-socialist country has probably shaped her understanding of art as always relational, collective and contextualized endeavor. She has been involved into different grass-root initiatives, such as organizing the festival Improspekcije since 2007, questioning the art form of improvisation, being part of a direct democratic body Plenum of Zagreb Dance Centre, engaged in setting up of the FUTUR II – temporary space for people and dance in Zagreb, and running the Fourhanded Artistic Organization, publishing the magazine “Čitanka“ and organizing an annual performative conference. 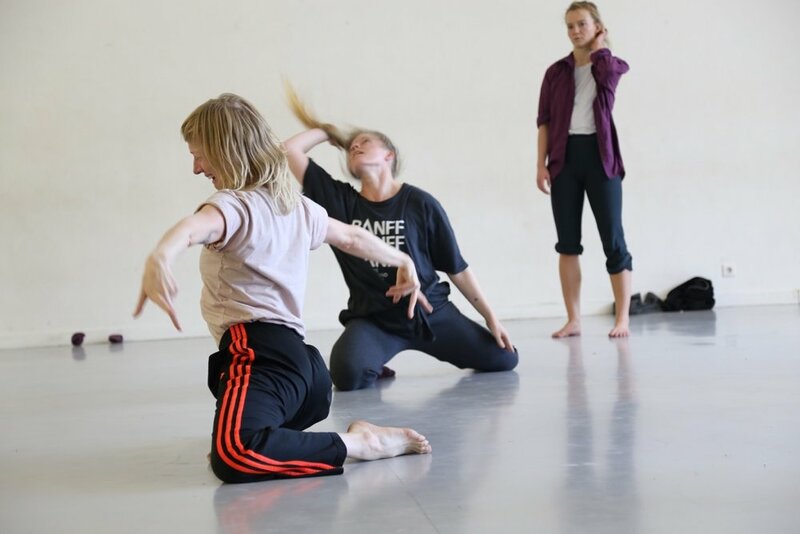 Sonja also organizes Time we meet dance sessions in Zagreb and sometimes joins the Shared Practice format in Berlin facilitated by choreographer Lea Martini. Sonja has collaborated with numerous artists, among which a long-term collaboration with director Willy Prager, as well as with Ana Kreitmeyer, pavleheidler, Silvia Marchig. As a performer she has been working with choreographers Meg Stuart, Isabelle Schad, visual artist Sanja Iveković, and many others. In her work as a choreographer, dance is always a relational gesture, her choreography extending from re-inventing body-based practices to re-appropriating performance formats. Emancipating the figure of a dancer, she questioned objecthood and subjectivity of the performing body in her research and work for many years, nowadays focusing on the synesthetic properties of embodiment with tactility as a base. She thinks of her work with the movement as embodied and conceptual at the same time, where intuitive resources of the bodymind can be solving and asking questions by dancing, bringing into being ‘im/materials’ that are holding concepts within themselves. She believes that fragility, shadows, being lost and struggling are gifts and some of the best gates to enter celebrating and serving humanity through performance as one possible form of action.